Emergent Netizens presents the first solo exhibition in over a decade of Nigerian artist Ike Francis as he continues to explore the changing technological landscape in Africa today. In his installations, canvases, and mixed media works, Francis incorporates used circuit boards, discarded electronic parts, maps, and labels to form intricately designed cityscapes and figurative compositions. 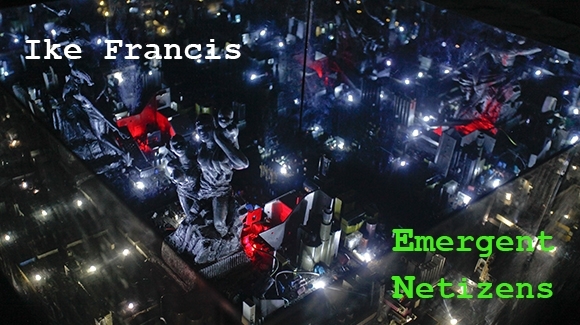 Francis examines how technology is increasingly dissolving personal and cultural barriers, creating new definitions of national identity and connectivity in a global environment. As Francis’ practice evolves to include large-scale installations, this exhibition highlights his recent experiments with new materials and processes, including lights, mirrors, and reflective surfaces. Through the metaphor of the city and its inhabitants, Francis creates a portrait of “netizens,” truly formed by the realities of the digital age.